"Minnetonka" redirects here. For other places with the same name, see Minnetonka (disambiguation). Minnetonka (/ˌmɪnɪˈtɒŋkə/ MIN-i-TONG-kə) is a suburban city in Hennepin County, Minnesota, United States, eight miles (13 km) west of Minneapolis. The population was 49,734 at the 2010 census. The name comes from the Dakota Sioux mni tanka, meaning "great water". The city is the home of Cargill, the country's largest privately owned company, and UnitedHealth Group, the state's largest publicly owned company. According to the United States Census Bureau, the city has a total area of 28.22 square miles (73.09 km2), of which 26.93 square miles (69.75 km2) is land and 1.29 square miles (3.34 km2) is water. Part of the city includes the eastern tip of Lake Minnetonka, one of the largest lakes in Minnesota. The outlet of Lake Minnetonka is Minnehaha Creek, which winds through south Minneapolis and flows over Minnehaha Falls and into the Mississippi River. Minnetonka is located 8 miles (13 km) west of Minneapolis, in Hennepin County. The headquarters of Carlson Companies are in Minnetonka. The headquarters of Cargill are located in Minnetonka and are in the Wayzata Post Office area. Founded in 1865, Cargill is the largest privately held corporation in the U.S. in terms of revenue. Other companies based in Minnetonka include the uniform companies AmeriPride Services and G&K Services. Since the mid-19th century, Minnetonka has evolved from heavily wooded wilderness through extensive farming and thriving industrialization to its present primarily residential suburban character. The Dakota and Ojibwe Indians were the first people to settle in the area. They believed the land around Lake Minnetonka (minne meaning water and tonka meaning big) was the legendary home of an extinct race. The first recorded exploration of the area by European settlers was in 1822, when a group from newly constructed Fort Snelling made its way up Minnehaha Creek (then known as Brown's Creek or Falls Creek) to the lake. In 1851, the Dakota sold the area including Minnetonka to the United States with the Treaty of Traverse des Sioux. The first census, the Territorial Census of 1857, lists 41 households. Twenty-nine of the heads of households are listed as farmers. The occupations of the remaining twelve are associated with the operations of Minnetonka Mill and a nearby hotel. The Cargill Lake Office, occupying a former mansion, houses the company's top executives. In 1860, after only 8 years of operation, the sawmill closed. In 1869, a flour and grist mill were constructed and operated until the late 1880s. In 1874, Charles H. Burwell came to manage the Minnetonka Mill Company, and he built a Victorian home on the north bank of Minnehaha Creek (Minnetonka Boulevard at McGinty Road East) for his family. The Charles H. Burwell House is now on the National Register of Historic Places and is owned by the city. There were two other mills in Minnetonka. The St. Alban's Mill, which was less than 1 mile (2 km) downstream from Minnetonka Mills on Minnehaha Creek, operated as a flour mill from 1874 to 1881. A grist mill built on Purgatory Creek was washed out in a flood shortly after construction. Minnetonka Mills, with its post office and port for Lake Minnetonka, was the principal business and trading center for a large area until the 1870s. Between 1883 and 1956, the area within the original 36-square-mile (93 km2) township grew smaller as Wayzata, Hopkins, Deephaven, Woodland and Saint Louis Park incorporated or annexed portions of then-Minnetonka Township. Excellent transportation facilities to Hopkins and Minneapolis began to transform the township's economy. Train service to Minneapolis had been available since the 1880s, and in 1905 streetcar service began. The attraction to become a city wage earner was great and rapid transit made it possible. In 1956, as a maneuver to prevent neighboring villages from continuing to annex portions of then-Minnetonka Township, residents in 1956 voted to establish a village out of the remaining 28 square miles (73 km2), and the area was incorporated as Minnetonka Village. However, Minnetonka Village lasted only thirteen years. The complexities and the heavy demands of administering a rapidly developing community required professional management and larger representation. In 1969, a city charter was approved to serve the 35,000 residents. Ridgedale Center is located in Minnetonka. The city of Minnetonka is covered by three independent school districts. The Hopkins School District, which encompasses the central and eastern part of Minnetonka; the Minnetonka School District, in the western part of city north of Lake Minnetonka; and the Wayzata School District, which covers an area along the southern boundary of the city. Some students attend public schools in other school districts chosen by their families under Minnesota's open enrollment statute. The Hennepin County Library has its headquarters in the Ridgedale Library in Minnetonka. The system also operates the Minnetonka Library. As of the census of 2010, there were 49,734 people, 21,901 households, and 13,619 families residing in the city. The population density was 1,846.8 inhabitants per square mile (713.1/km2). There were 23,294 housing units at an average density of 865.0 per square mile (334.0/km2). The racial makeup of the city was 90.0% White, 3.7% African American, 0.3% Native American, 3.1% Asian, 0.7% from other races, and 2.1% from two or more races. Hispanic or Latino of any race were 2.4% of the population. There were 21,901 households of which 25.9% had children under the age of 18 living with them, 52.1% were married couples living together, 7.3% had a female householder with no husband present, 2.8% had a male householder with no wife present, and 37.8% were non-families. 31.1% of all households were made up of individuals and 11.9% had someone living alone who was 65 years of age or older. The average household size was 2.25 and the average family size was 2.85. The median age in the city was 45 years. 20.8% of residents were under the age of 18; 6% were between the ages of 18 and 24; 23.2% were from 25 to 44; 33.3% were from 45 to 64; and 16.7% were 65 years of age or older. The gender makeup of the city was 47.5% male and 52.5% female. As of the census of 2000, there were 51,301 people, 21,393 households, and 14,097 families residing in the city. The population density was 1,893.0 persons per square mile (729.7/km²). There were 22,228 housing units at an average density of 818.9 per square mile (316.2/km²). The racial makeup of the city was 94.40% White, 1.50% African American, 0.20% Native American, 2.29% Asian, 0.03% Pacific Islander, 0.57% from other races, and 1.03% from two or more races. Hispanic or Latino of any race were 1.28% of the population. 24.7% were of German, 13.8% Norwegian, 9.1% Irish, 8.2% Swedish and 6.7% English ancestry. There were 21,393 households out of which 29.1% had children under the age of 18 living with them, 56.6% were married couples living together, 6.8% had a female householder with no husband present, and 34.1% were non-families. 27.3% of all households are made up of single individuals and 9.3% had someone living alone who was 65 years of age or older. The average household size was 2.37 and the average family size was 2.92. In the city, the population was spread out with 23.1% under the age of 18, 6.0% from 18 to 24, 28.5% from 25 to 44, 28.4% from 45 to 64, and 14.0% who were 65 years of age or older. The median age was 41 years. For every 100 females, there were 91.8 males. For every 100 females age 18 and over, there were 88.7 males. According to the 2000 US Census, the median income for a household in the city was $83,437. 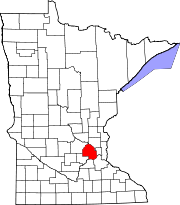 Minnetonka is located in Minnesota's 3rd congressional district, represented by the democrat Dean Phillips. The Minnetonka Dynamo, a bandy club, became national champions of bandy in 1994, 1998 and 2000. The Minnetonka Millers, a Class A baseball club, became state champions in 2015, 2016, and 2017. The Millers play at Veterans Field, located on the campus of Minnetonka High School. Gary Jacobsen - professional golfer. Tom Petters – former CEO of Petters Group Worldwide convicted of running a 3.65 billion dollar Ponzi scheme. Mike Ramsey – member of United States 1980 Olympic Gold Medal hockey team, the "Miracle Team"
^ "Contact." Carlson Companies. Retrieved on February 9, 2011. "Carlson 701 Carlson Parkway Minnetonka, MN 55305 U.S.A."
^ "Wayzata city, Minnesota[permanent dead link]." U.S. Census Bureau. Retrieved on December 23, 2010. ^ "Twin Cities Locations Archived 2011-07-26 at the Wayback Machine." Cargill. Retrieved on December 23, 2010. "15407 McGinty Rd Wayzata, MN 55391"
^ "Privacy." Cargill. Retrieved on December 23, 2010. "Our headquarters are in Wayzata, Minnesota in the United States of America." ^ "#1 Cargill - Forbes.com". www.forbes.com. Retrieved April 1, 2018. ^ "About Hennepin County Library Archived 2010-02-25 at the Wayback Machine." Hennepin County Library. Retrieved on March 24, 2010. ^ "Minnetonka Library." Hennepin County Library. Retrieved on March 24, 2010. ^ United States Census Bureau. "Census of Population and Housing". Retrieved July 23, 2014. ^ "Population Estimates". United States Census Bureau. Archived from the original on October 19, 2016. Retrieved May 30, 2018. ^ "Post Office Location - MINNETONKA Archived 2010-12-31 at the Wayback Machine." United States Postal Service. Retrieved on December 23, 2010. ^ "Post Office Location - MINNETONKA CARRIER ANNEX Archived 2010-12-21 at the Wayback Machine." United States Postal Service. Retrieved on December 23, 2010. ^ "Lawrence Journal-World - Google News Archive Search". news.google.com. Retrieved April 1, 2018. ^ a b Salisbury, Bill (December 14, 2015). "Gretchen Quie, opened governor's house to public, dies at 88". St. Paul Pioneer Press. Retrieved January 2, 2016. Wikivoyage has a travel guide for Minnetonka.